Only Straight Sizes? I Don't Give a Monki! Let me start with a disclaimer. I absolutely DO care if a brand only stock straight sizes and I think that more needs to be done with plus size fashion, especially when it comes to the top end of plus sizes. However when it comes to fashion it's always about making it work for you and dressing to your own style. I am all about making items work for your body - and that is why I was excited to learn about Monki. I'll be honest I have heard whisperings of Monki on social media for the last few months. 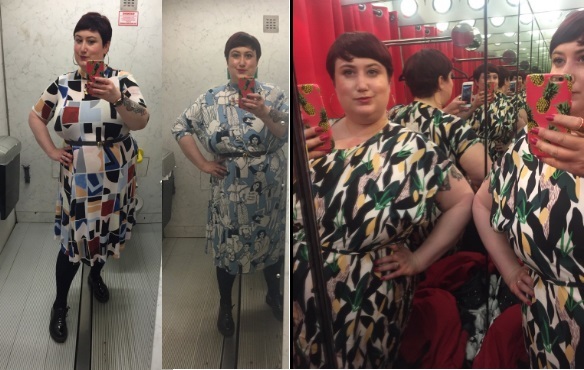 Lots of fat ladies have been tweeting and Facebook'ing photos of them in amazing outfits and then proclaiming that they're wearing a size medium or large. I know in some ways we shouldn't be celebrating the fact that clothes fit our bodies, but we're still in an age where we have to. 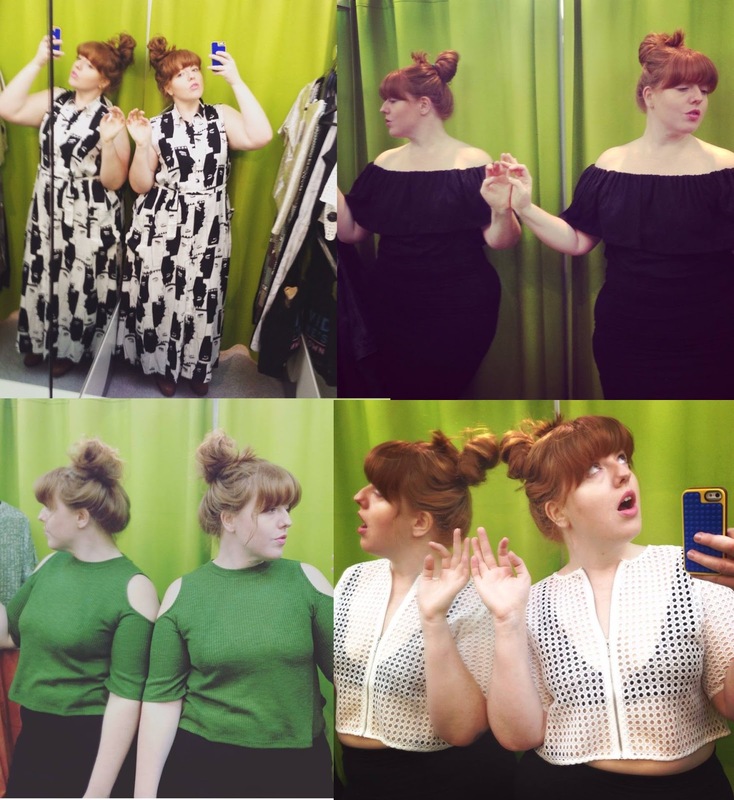 Last week the lovely Danielle Vanier was chosen for a Monki campaign about individuality and celebrating bodies. This is such an exciting move because a brand that don't stock plus size clothing have used a fat body for a campaign nationally and that's got to be a good thing. Unfortunately Ms Vanier has had mixed response to this, with many people complaining that she shouldn't have worked with a brand that don't stock plus sizes. Whilst I agree that Monki could do more I don't think that her being used for a campaign can be seen as a bad thing at all! Unfortuantly I don't live near a Monki store and I wouldn't risk buying online because I can't see, feel and stretch the items in my hand but I have been told that there are a few option in store that I would be able to make work. One day, I'll get my hands on some Monki items of my own and show you for myself... 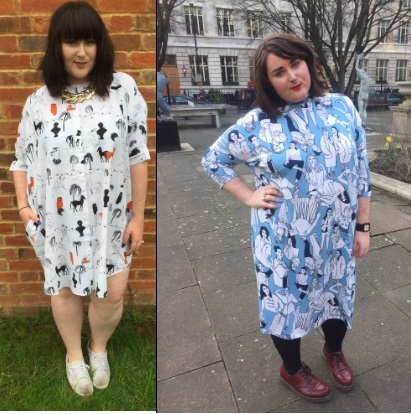 But for now, here are some lovely ladies showing you how they rock Monki and made it work for their fat bodies! 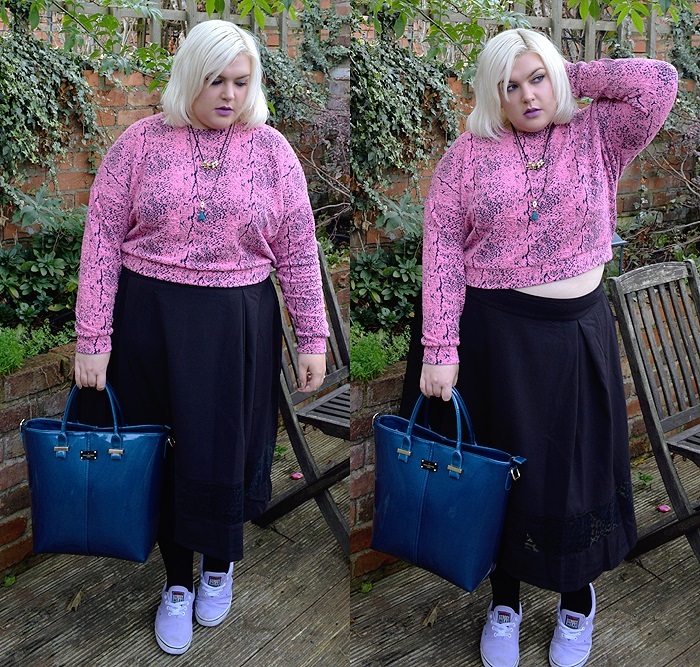 Kathryn from http://www.misskathrynsmisstakes.co.uk/ wears a Large size shirt on her size 24 body! Lorna https://twitter.com/TheGingerPear wears a 20/22 black and white dress and green top are large, white top is a medium, black top is also medium but she feels could have worn a small. 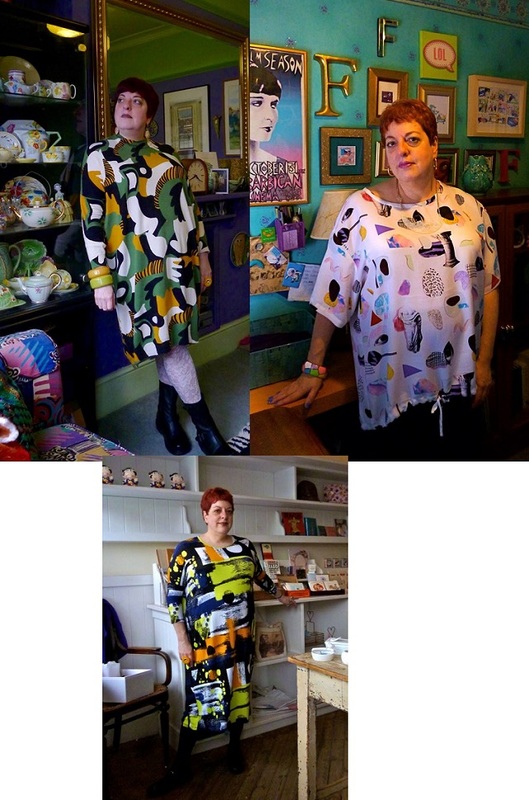 Lovely Lottie https://lottielamour.co.uk/ usually wears a size 22. The top two items are large and the bottom one is a medium. 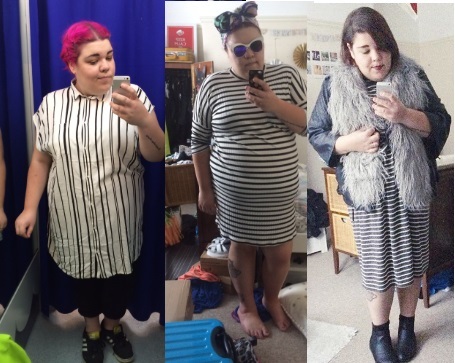 The ever glamorous http://buttercupsfrocks.tumblr.com/ usually wears a size 22 - the dress at the top is a medium, top next to it is a large and the dress at the bottom is an extra small!! 'Vintage' Monki thanks to Nancy http://www.sugar-darling.com/ and this jumper from 2014 - jumper is a size large on a size 22 body. Bethany http://archedeyebrow.com/often features Monki on her blog. She's a 22/24 in these pics and both dresses are a size large. Glorious https://twitter.com/mellymeep usually wears a 24/26 - she warns that not all items will be appropriate for higher end plus sizes, but always worth a try! https://twitter.com/ChristinaMcMc wears all of these in a medium and generally wears a size 20. Of course not all items will work for plus size bodies so it's wise to go to a store or ask on social media for opinions. It tends to be that up to a size 22/24 has many more options that large plus sizes, but if you're over a size 24 then you're probably used to that anyway! That said, not disregard them - if you have a chance to try them, give them a go! Let's all pray that one day Monki will do an XL and an XXL range and give even more of us the chance to wear their items - YAY! If I get a chance to try any items I'll be sure to report back! 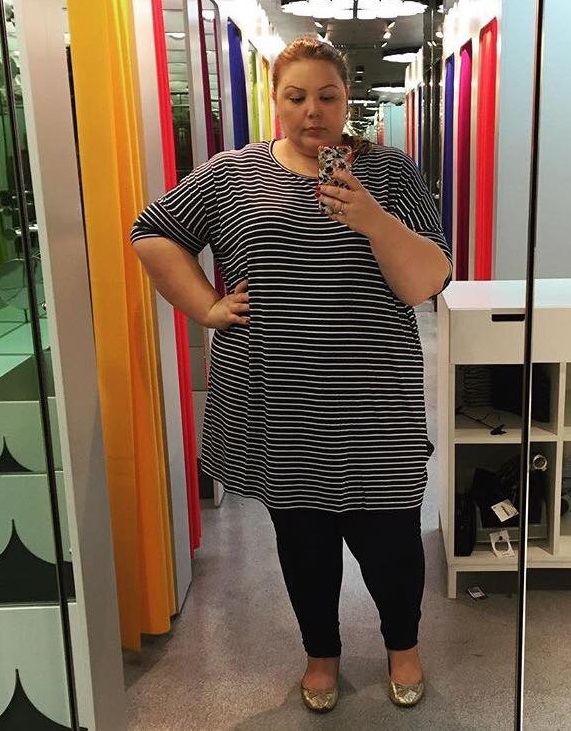 Have you shopped a straight size store and been suprised at items fitting? Tell me more!